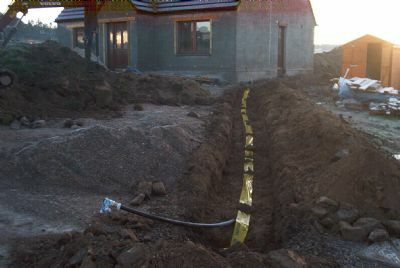 We complete the laying and back-filing of the electric cable and water pipe trenches, as well as some landscaping (i.e. moving pipes of rubble around the site) and laying in and levelling the sewer pipes. Slightly frustrating day as we are forced to dig-up and replace some newly laid sewer pipe due to a crack! However, Benny & Robert return and make a start building the main sewer manhole. Inside, we finally get the 6 gang 2 way light switch wired up and working (no mean feat), ready for the electrical connection due from the Hydro Board tomorrow. A very frustrating day!! 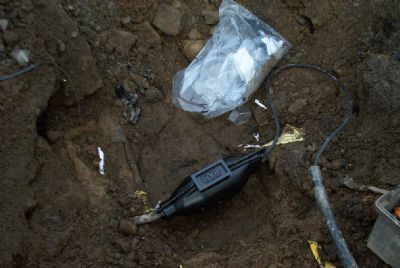 The electricity men arrive but we can't pull the mains cable through the conduit into the house! 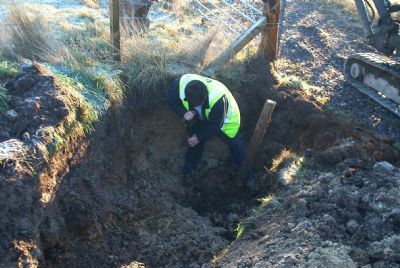 Also the hole in the ground at the connection end is not big enough!! However, Robert does make excellent progress on building the 1.5 metre manhole at the bottom of the garden. A new day and everything is back on track. 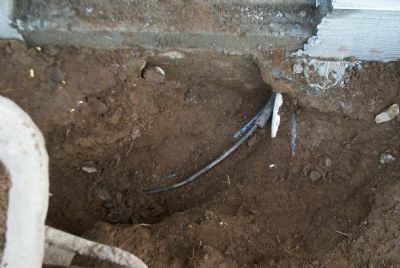 After much digging (and sweating) we break into the conduit at the side door and with Robert's assistance we get the mains cable into the house. Right on cue the Hydro men return (earlier than they said!!) 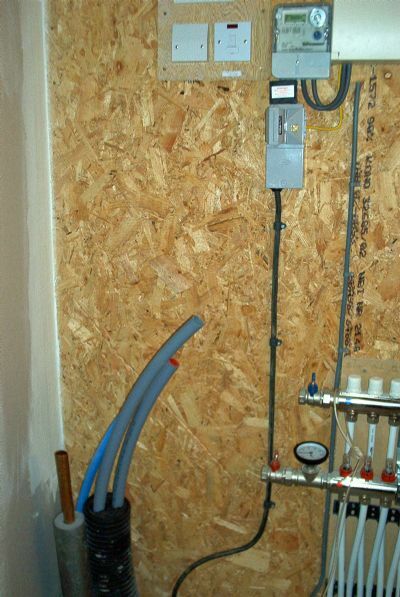 to 'hot tap' us into the mains electricity. 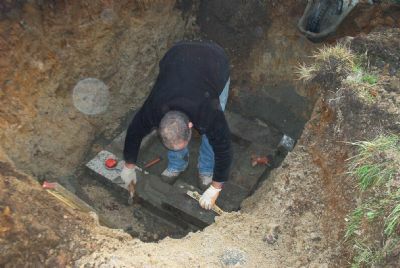 Then the digger man arrives to collect his machine so he finishes back-filling the hole for us (thanks to Norman and Pete for their help beforehand)! 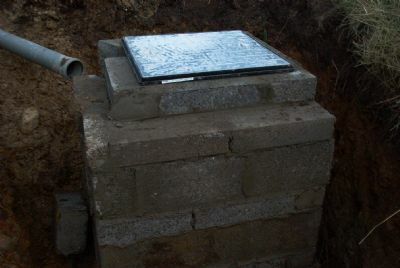 In addition to getting the electricity meter fitted, Robert completes the slab for the heat pump, builds the steps for the front and side doors, AND the plumbers return (as promissed) to fit a new manhole base in place of the cracked one. All this and confirmation that we can now apply for a grant for our air source heat pump after 4 months wait. It's been a good day! 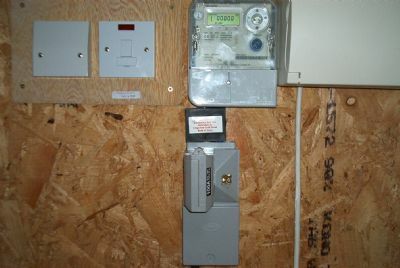 Another big day for us - we get our electricity supply connected to the consumer unit (note the 'tails' from the meter). 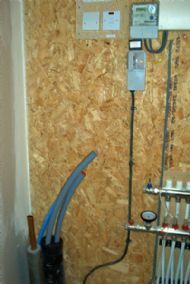 We finally have our own permanent electrical supply in the house! Despite a number of distractions (visitors, child minding, neighbours moving in, etc.) 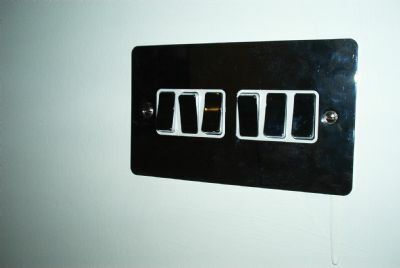 we do manage to do a bit more electrical second-fix - i.e. 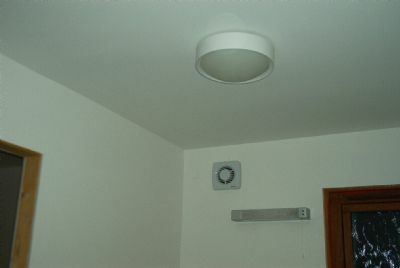 the lights and fan in the downstairs bathroom.